Google Maps brings about lots of little Easter eggs, whether it's the hidden location of Edward Snowden, Area 51 or even its own mini game of Pacman, but the latest addition is a little more personal. 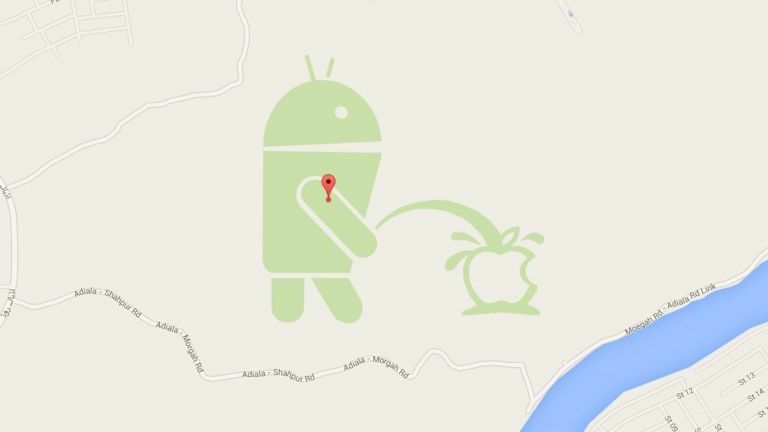 If you're searching on Google Maps in Pakistan you may end up coming across a certain little green robot showing his real feelings toward the Apple logo. A few miles out from Islamabad, the country's capital city, you'll find the Android logo urinating directly onto the Apple logo – but it's not currently clear why. To the best of our knowledge only Google itself can edit the Maps system, if it was fair game for everyone we'd expect to see more of this stuff all over the world, so it's not currently clear why the image has been hidden here or even made at all. Our best bet is a disgruntled Google employee who has a bit of a problem with the Apple brand but we've not heard any official comment from the search engine just yet. Maybe it has something to do with the launch of the Apple Watch.